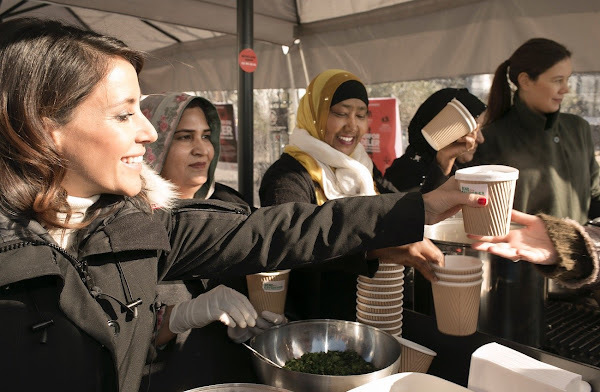 On February 29, 2016, Princess Marie of Denmark attended a soup selling (Send Flere Krydderier) activity organized for the benefit of world's poorest women in the city center of Copenhagen. The Princess sold zucchini soup whose price is 25 dkk per bowl for twenty minutes. Princess Marie has been a determined patron of DanChurchAid event since 2011. Marie looks nice and engaged in her task and the two volunteers wearing their traditional dress under their padded jackets are too charming for words. And the yellow soup ladle matches with the lady's yellow head scarf! Nice fotos.